Liam is a Data Scientist at Forest Devices. He primarily develops analysis software for the ALPHASTROKE, but regularly works on all facets of hardware and software. Prior to joining Forest, Liam received a BSc in electrical engineering from the University of Pittsburgh in 2018, with a concentration in signal processing and communication systems. 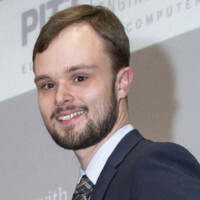 While at Pitt Liam conducted research concerning the automatic detection and segmentation of acute stroke lesions in MRIs, and autonomous aerial vehicles for indoor use.